By the time retirement rolls around, most Americans have saved less than half of the amount that experts recommend. Instead of being an unprepared statistic, make a resolution to max out your retirement savings, and let compounding interest bolster your savings. The IRS changes annual retirement contribution limits each year. As a result, it can make it tough to maximize the amount you contribute each year. Maybe you thought just 5% of your paycheck would do it? Well, for most people, it won’t. 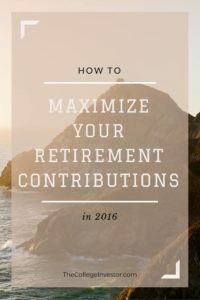 Here are all the ways and combinations that you can maximize your 2016 retirement contributions based on the 2016 Retirement Contribution Limits. Employer sponsored retirement plans allow people to contribute pre-tax dollars to an investment account. Investments in these account grow tax-deferred until you withdraw. Withdrawing funds from employee sponsored plans before the age of 59 ½ leads to a 10% withdrawal penalty, and you will be taxed in the year of withdrawal. It’s best to forget about this money until age 59 ½. In 2016, the IRS maintained contribution limits for 401(k), 403(b), 457 elective deferral plans, and Thrift Savings Plans (TSP) at $18,000. Employees over 50 can contribute an additional $6000 in catch up contributions, which is the same as 2015. Contributions to these plans are tax deductible, and investments in these plans grow tax-deferred. In addition to an employee’s contributions, an employer may match up to 25% of your salary in an employee sponsored plan (up to $35,000). On average, companies match 2.7% of salary contributions. Even if you can’t max out your employer sponsored retirement plan, strive to achieve your employer match. Individuals who are paid bi-weekly need to contribute $692.31 per paycheck to max out their employee sponsored plans. Individuals who are paid monthly need to contribute $1500 per paycheck to max out their employee sponsored plans. Some small businesses (those with fewer than 100 employees) operate Simple IRA plans rather than 401(k) plans. Individuals enrolled in this plan will receive either an employer match or a 2% “non-elective” employer contribution (which they receive whether or not they contribute). Simple IRA participants may contribute a maximum of $12,500 to this plan. To max out this plan, people who are paid biweekly should contribute $480.77 per paycheck, and those paid monthly should contribute $1041.67 per paycheck. Solo 401(k) plans (also called self-employed 401(k) plans) allow self-employed individuals to invest in a tax-deferred manner, but solo 401(k) plans operate under slightly different rules. Individuals may contribute up to $18,000 ($24,000 for those aged 50 and older), but self-employed people may contribute no more than earned income in a given year. For example, if a self-employed person only earns $15,000 from their business, their contribution may not exceed $15,000. Contributions to a Solo 401(k) and any other employee sponsored plans (401(k), 403(b), 457, TSP or Simple-IRA) may not exceed $18,000 ($24,000 for those aged 50 and older) in a given year. For example, if a person contributes $10,000 dollars to a traditional 401(k), they may also contribute $8000 to a solo 401(k) provided that they earned at least that much self-employed income in a given year. In addition to contributing up to $18,000 of “elective” contributions, self employed individuals may also contribute pre-tax “non-elective” employer contributions to a Solo 401(k). (The contribution limit is 20% of operating income after deducting both contributions for yourself and ½ of the self employment tax deduction). Assuming an individual has sufficient operating revenue, they should contribute $4416.67 per month to max out both the employer and the employee side of their Solo 401(k). To max out just the employee half of a Solo 401(k), individuals need to contribute an average of $1500 per month. A SEP-IRA provides a simple method for small business owners (including self-employed individuals) to contribute to their own retirement accounts and their employee’s retirement accounts. SEP-IRA plans do not allow “elective” deferrals, but an employer (or a self-employed individual) may contribute up to 25% of an employee’s (or their own) income as non-elective deferrals up to a max of $53,000. Self employed people who wish to max out their SEP-IRA need to contribute $4416.67 per month to their SEP-IRA, assuming that they have sufficient operating income to max out. Side hustlers have a unique advantage when it comes to tax-deferred retirement investing. An individual who earns regular W-2 income may enroll as an employee in their employer’s retirement plan, and they are subject to the contribution rules of the plan. In addition to enrolling in their employer’s plan, side hustlers may open a SEP-IRA and contribute up to 25% of their side income tax deferred into the SEP-IRA. If a side hustler’s main employer contributes to a SEP-IRA, a side hustler may choose to contribute side earnings to a Solo 401(k) rather than a SEP-IRA. Ready to start side hustling? Check out our post of over 50 ways to get started with a side job. 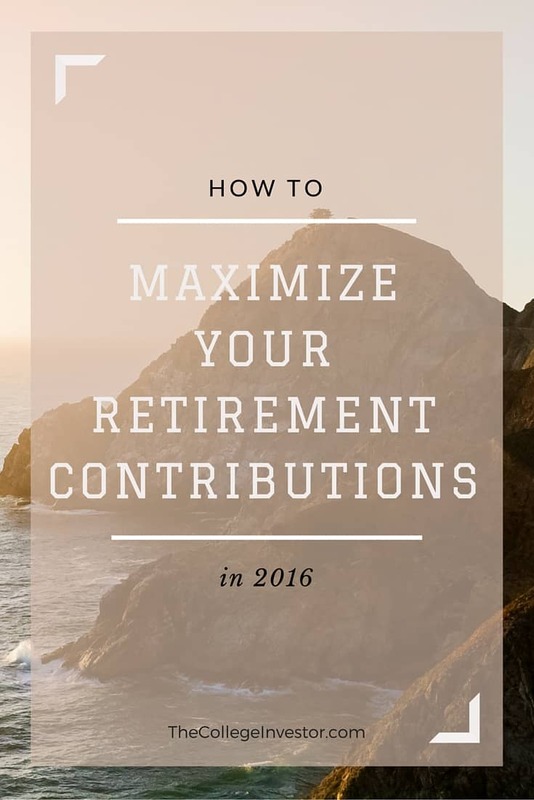 For 2016, the maximum IRA contribution remains the same at $5,500 if you are under 50, and $6,500 if you are over 50. Traditional IRAs allow taxpayers to deduct their contributions, and the contributions grow tax deferred until the time of withdrawal. Single filers who earn less than $61,000 are eligible deduct one hundred percent of deductions. Single filers may partially deduct their contributions if they earn up to $71,000. Couples who are married filing jointly may make contribute the maximum if they earn less than $98,000, and they may make partial contributions if they earn between $98,000 and $118,000. The IRS did not change these limits in 2016. Roth IRAs do not allow participants to deduct their contributions, but the contributions and growth are not taxed at the point of withdrawal. Single filers who earn less than $117,000 in 2016 are eligible to contribute the full $5500. Filers who earn between $117,000 and $132,000 can make partial contributions. Couples who are married filing jointly can both contribute up to $5500 if their joint income is less than $184,000; they are eligible for partial contributions if they earn between $184,000 and $194,000. Not sure which IRA makes the most sense? Check out our Ultimate Guide To Roth vs. Traditional IRAs. The retirement savings tax contribution credit allows lower income individuals to receive tax credit for contributing to an employer sponsored retirement plan or an IRA. Single filers who earn less than $27,750 will receive a tax credit worth 50% of their contributions in 2016. Single filers who earn between $27,750 and $46,125 will receive a tax credit worth 10-20% of their contributions depending on their income. The maximum tax credit for single filers is $2000. Married couples who file jointly will receive a tax credit worth 50% of their contributions if the earn less than $37,000. Married couples who file jointly will receive a 10-20% tax credit if they earn between $37,000 and $61,500. The maximum tax credit for married couples who file jointly is $4000. Readers, do you plan on increasing your retirement contributions this year? Great post. There’s a lot of useful info for investor just starting out. I think it;s important to understand the vehicles available to us as U.S. investors. Thanks for sharing. It’s very important to know exactly what you can do with each account – it’s how you can max things out.